Sociopaths really do not understand honesty, they believe it is something that only the weak and vulnerable does. Their mind is so warped and twisted, they truly cannot comprehend truth, love and compassion. Being exposed for the shallow, manipulative, soulless liar is something that terrifies the sociopath/narcissist. The sociopath/narcissist has a few primary goals, that do not change much through out ones entire existence. That goal is to control others by any means possible. Having control ensures the sociopath can live an easy, carefree life, never having any real responsibility. The sociopath wants the outer world to perceive him/her as a do-gooder. Someone who is empathic, and hard working. Something all of us who have ever had to deal with this type for dysfunctional person know all to well. All of us that have dealt with a character flawed individual (sociopath/narcissist) already know that they believe they are too "special" and "precious" to actually work hard for something. This is the reason they seek out people whom they believe to be “weak”. They target these types of people because they are compassionate, generous and loving. The sociopath knows that they will be able to fully take advantage of their kindness. They don't see people as potential friends or future lovers. They see them as an object they can use to do all the work that they believe they themselves are to good to do. The sociopath/narcissist will take the credit, and recognition for the hard work and responsibility that is done by someone else. People who are unaware that they are in a relationship with a sociopath do not realize it until their life has been turned upside down by one. There is never enough anyone can give the sociopath to satisfy them. Many have tried to give and give to the sociopath, only to exhaust themselves, and realize they are attempting to fill a black hole of nothingness. The sociopath is so shallow, there is nothing in this world that will ever fill the emptiness that they are. YOU WILL NEVER BE ABLE TO PLEASE A SOCIOPATH! Everything is very temporary for them. They leave their victims feeling alone, defeated, and broken. The sociopath is envious of others. Not because of anything other than they want to be the center of attention at all times. I have personal experience with a female sociopath who has aged awfully. I'm sure this person has always been hateful by nature. As she has aged, not so gracefully she has becomes even more hateful, bitter and resentful. I always wondered if the sociopath ever changes with age.. For most of us when we age we do not have the energy we did when we were younger. But I have experienced with a certain sociopath who I have to still somewhat deal with, that aging does not stop their reign of terror. I absolutely love your blog! I stumbled upon your "Sociopathic Parents destroy children and the ex partner" when doing research on the effects of children raised by sociopaths. I was really quite arrogant to the evils in this world until I met a sociopath. My world was instantly flipped upside down-within one year of having them in my life I was diagnosed with high anxiety, PTSD, my daughter was born and had suffered two strokes while I was pregnant with her (she's 2 now and has 5 therapist and a lifetime full of therapy-all at the thanks of sociopath. Job, school to school, guy to guy, babysitter to babysitter and victim to victim. My therapist told me they aren't clean people because it's a symbol/representation of the mind (messy, unorganized, wreck less and cluttered). To this day I wonder how to you severe the ties with a sociopath? Even something as drastic as changing your name and moving across the world seems like it wouldn't be enough. They are hateful evil spineless creatures, you cannot break ties with them-they cannot stand rejection (after talking to about 20 ex boyfriends and even ones parents I've figured that out on my own)-seeking revenge and retaliation to levels of criminal activity. I think this type of person shoutout be thought on high school health classes so they know to avoid these people at ALL COSTS. Your comment saying you were quite arrogant to the world of the evils, hit home with me. I would say in my words. I was quite innocent. Yes I dealt with my fair share of drama and backstabbing two faced friends in highschool. And I thought that was traumatizing. Until a true sociopath showed me what real evil and emotional, spiritual, mental, trauma was. I wish I was still innocent from the evil of these people. And I am not talking about the killers and psychos. I'm talking about the sociopath that looks like me or you. And is quite charming and convincing. But underneath all that is an agenda of pure evil. Nothing but evil intentions. No good. No soul. What is with this creatures. Are they human. The bible says the hell is empty-all devils walk the earth, masters of disguise. The bible also says Satan will be charming and hard to resist, you'll be sucked in to his path of destruction-I can't help but wonder if the sociopath in my life is satan himself. The evil and destruction caused to everyone in their family, their own children, just anyone in their path. Its pure evil. There is no way they have a soul, empathy or a heart. I believe they are out here to test us. At one point when I was being targeted by a sociopath, I felt defeated, depressed, and hopeless. I DID FEEL LIKE A VICTIM and I was feeling very sorry for myself. 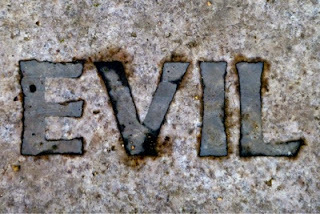 At some point I realized how unproductive I had become because of ONE single evil person. I was reacting and doing everything the sociopath wanted me to do. I was hiding, I had been silenced. what about the sociopath & its many minions targeting me at work??? i need help.. do i expose them, tell HR or walk away & find a new job. there are so many people terrorizing me at my workplace. the company cant fire half or more of the employees. im afraid telling HR might make this worse for me. Good evening and good day, ladies and gents. I am a bit confused about the overwhelming theory regarding sociopaths as monsters. I strongly believe it is a faulty thinking to state that all sociopaths are the same. They are individuals with common symptoms created by enviromental trauma with different nature. It is a faulty understanding to state that "all sociopaths are the same" when no human being is the same as other. What I fail to understand and the reason I am yet confused it is not the hatred, since I do understand that you have been hurt by such a person yet I have not found a single article to remind people that not all of us are the same. We all wear masks. Social mask. Emotional mask. All humans. What is a social mask you may ask. Well, Erving Goffman used a theatrical metaphor to explain how one presents oneself in different social situations. Individuals put on different social masks to adapt to the role they are supposed to play in order to meet some ‘societal standards’. There’s a good chance, too, you change your masks so habitually you don’t even notice doing it. Maybe you’ve done it your entire life. Ultimately, we wear our social mask in an attempt to fit in. We just want the approval of other people. In our minds, we believe that in order to win this acceptance, we need to behave in certain ways. Of course, this is actually true. Some people will only accept you if you act in a particular way. But everyone has different expectations and desires of how other people should behave. It is a surviving mode implied to us by todays society and the norms of normalcy. I do not seek anything else but understanding as you pictured all of "my people" (and I simply call them that for the sole reason that you stated in one of your articles that you do not wish to be classified in the same group as us) as being quote -monsters- -evil- -shallow- -empty- unquote things. I disagree. We are all different and there are many levels of sociopathy. I am a self-diagnosed sociopathic woman. The reason for being self diagnosed is because it is to risky to actually go to any theraphy sessions. Why? One of the so called treatment is surgical operation, or being locked into facilities and be pumped with a variety of medication that will leave me without the ability to think. I do not desire that, reason why most of us do not seek help. However we do look within ourselves not to learn how to manipulate (not all of us at least) but to understand what we are. I personally felt different from others from a very young age and have been bullied from it reason why I learnt how to construct my mask so the other kids will leave me alone. But this is not avout that. I never hurt animals, I frown upon those who do. What disgust me are humans. Why? Because of their closed-minded perception as you so earnestly stated all over your blog. I know you will not stop and I do not know if you will even reply to this however my point is, not all sociopaths are the same. Our emotions are underdeveloped, yes, however is it so wrong that we mimic them in order to be accepted? You say we are monsters. You say we are evil. But let me ask you, who created us? Who made us like this? Society. Please do remember, not all of us are as you think. I know many of you had had bad experiences with sociopaths in the past and that I cannot understand your pain but through logic yet what you are doing is throwing a whole basked of appels away due to a few rotten ones. I would like you to think of it and perhaps try not to include all of our "species" (as I recall you stated in one of your articles that we are a different class, a different specie that is closer to primitive animals, to paraphrase). If you bothered to read this thank you and I look forward to your reply if it ever arrives.